Festivities of the Thanksgiving weekend usually start off with a hearty dinner with family followed by socializing at either the movie theaters, or getting oneself damn near killed at the local shopping mall for Black Friday deals. But, there’s also a long standing tradition that continues to be strong over the extended holiday weekend, and that’s the special holiday sports match-ups. While no means crucial games in the long run, certain professional teams schedule these games for the sole purpose of exposure. While most TV shows go on hiatus for the Thanksgiving weekend, sports programming fills that void with their special broadcasts and are able to be watched by not just their faithful fans, but also by anyone tuning in with the rest of their family. Whatever is planned in everyone’s own Thanksgiving celebration, it’s highly likely that a good many households in America have managed to makes sports entertainment at least some part of the holiday. And if it’s not a live event that becomes a part of the season, audiences can still get their sports fix from the world of cinema as well. Indeed, Sports movies have become a beloved genre of film on it’s own, and many of them are released and/or watched more often this time of year than any other. But, sports movies are in fact surprisingly varied the more you look at them as a whole, and have become beloved entertainment no matter the time of year. Sports themes and subjects can be found in a whole variety of genre pictures. It’s a sub-genre that isn’t as restrictively defined as others and you can easily lump a film from a whole bunch of different genres that would fit within this category. There are sports movies that can fall under the banner of historical films, or counter-cultural films, or even romantic comedy. Hell, there are even sci-fi movies themed around sports. It’s such a loose definition that some even wonder if the Sports flick should even be considered a genre at all, due to this broadness. There is one thing for sure, however, and that there are some movies that can be described as nothing other than a sports flick, and that’s because they follow the sports movie “formula.” That formula often involves a band of underdogs coming together, united by a common goal, and overcoming the odds in order to achieve greatness. Sometimes, this formula is even whittled down to achievements by one gifted athlete who’s the hero of the story. And while many sports movies do attempt to stand out from the rest, few actually do stray from the formula. But, with a formula as common as this one, it also leads to a lot more repetitiveness. One of the things that does plague the Sports movie genre a lot is the lack of genre-defining standouts, instead letting the formula itself be the most recognizable factor. There are some all-time classics in the genre, but there are a lot more imitators that don’t quite rise up to the challenge and instead bleed into the background while trying to play it safe. This is what often separates the good from the bad in the Sports genre, and given how the scales have tilted more in the favor of the negative mostly, it only makes the good ones stand out more. First of all, let’s look at what makes a good Sports movie work. Just like any other genre of film, it ultimately comes down to the strength of the characters and the story. If those elements aren’t there, then the formula won’t work, and all you will be left with is a story that’s just going through the paces. This unfortunately happens to many Sports movies, many of which don’t put the focus into the right places. A common problem is that many sports movies put the mechanics of the sport first, and then consider the story second, thinking that audiences won’t notice and get swept up in the in-game action. This has been true with running through the paces movies like The Replacements (2000) or The Sixth Man (1997). It won’t matter how gimmicky you make the situation; unless audiences care about the characters and what’s going on, it won’t matter how well the sports action is shot. Formula is a crutch for some inexperienced filmmakers and it’s often why many of them turn to sports movies as a way to make their films look more impressive than they really are. Sports events are filled with a lot of pageantry and drama, but that doesn’t always translate into a good story. Human drama and competitive drama are two different things, and if you can manage to make both work together effectively at the same time, then you’ve achieved something. Unfortunately for most sports movies, there is always that disconnect. Even attempts to make compelling human drama can go haywire if it feels insincere. Let’s compare this in two movies about high school football; Varsity Blues (1999) and Friday Night Lights (2004). Varsity Blues is the lesser of the two because of the in-authenticity of it’s emotions. It’s heavy-handed in it’s human drama and flashy in it’s depiction of it’s on-field action. Friday Night Lights on the other hand treats it’s subject with a lot more restraint. It still has the human drama throughout, but it’s better integrated with the action on the field, making both feel just as integral to the overall story. It’s that balance that ultimately makes the sports movie formula work. Had Varsity Blues not tried too hard to make their story emotional, then it might have felt more authentic. Instead, the movie appealed more to the teenage soap opera crowd (which makes sense considering who made up the movie’s cast) and felt less like a film about the heart and soul of Football, which Friday Night Lights captures much more perfectly. In that film, you get a better sense of how the different characters lives are intertwined and motivated by the sports they play, and how much winning means to them. You see this in their struggles at home, sometimes showing kids dealing with abuse, and also in how the head coach (played by Billy Bob Thornton) can unite a team around all this turmoil and make his players believe they are winners. That helps us the audience feel more involved once the players take the field and snap the ball. It’s that balance between story and action that ultimately helps to make the good sports movie stand out. If there is a Sports genre that has had a better track record than the rest, it is the Sports biopic. Athletes are often the great legendary heroes of our modern age, and what better way to celebrate their accomplishments than with a film based on their life. While these movies also fall into formula many times, they can still manage to overcome them if the true-to-life story is compelling enough. And the history of Sports is not short of interesting subjects. But, again, it’s all in how you go about depicting these people and what they’ve done that makes the movies work. Case in point, a good sports movie would be the 1994 biopic Cobb, which featured Tommy Lee Jones as the notoriously brutish, and psychotic baseball player Ty Cobb. That movie is fascinating to watch because it shows the life and career of a very flawed man whose actions feel so out of line by today’s standards that it helps us to learn more about how the sport of Baseball has evolved. Contrast this with 1948’s The Babe Ruth Story, which white-washed the true story of a very flawed person who ended up becoming one of the world’s greatest athlete, and it inadvertently makes his life story feel dull in the process. The more fascinating the individual, the more introspective the movie must be, and even if it’s showing the less flattering elements of a person’s life, all the better because it at least humanizes the person and makes them feel more relatable. Sometimes using creative license even helps. The recent Jackie Robinson flick 42 plays around with the events of the groundbreaking baseball player’s life, like the extent of the relationship he had with the team’s owner, as well as making up whole chapters of his life and career. But, after seeing the final result, that matters very little, because what 42 gets right is the sense of Jackie Robinson the character, and the struggle with which he had to overcome. Creative license may be a cheat, but it’s a cheat that can deliver a better impact. This is a formula that has been very true not just for biopics, but for depictions of great sports events as well. Sometimes, the best thing that a sports movie can do is to shed light on a great moment that happened in any particular sport, and how that left an impact on history. These kinds of movies usually fall under the banner of the underdog story. One of the best examples of this would be the 1986 Basketball film, Hoosiers. Hoosiers is interesting because it doesn’t depict the story of some great professional team, or even one of the most earth-shattering upsets in sports history either. It instead focuses on a more universal story of a small Indiana town whose High School team beat the big city school and won the state championship out of nowhere. Doesn’t sound all that unusual, right? Well, when you see the movie, you find that it is less about the game itself and more about the people who made it happen, which includes a coach with a shady past (a brilliant Gene Hackman), his troublesome alcoholic assistant (Dennis Hopper), and a group of working class kids who’ve been told they’ll never amount to anything. The movie makes the final game feel much more important because of all the negative factors that have worked against these characters and it stresses how they’ve persevered against it. It makes us root for the underdog probably better than any other sports movie ever, and it’s all because it plays upon our desires to see winners deserve their victory and challenge the established order of things. 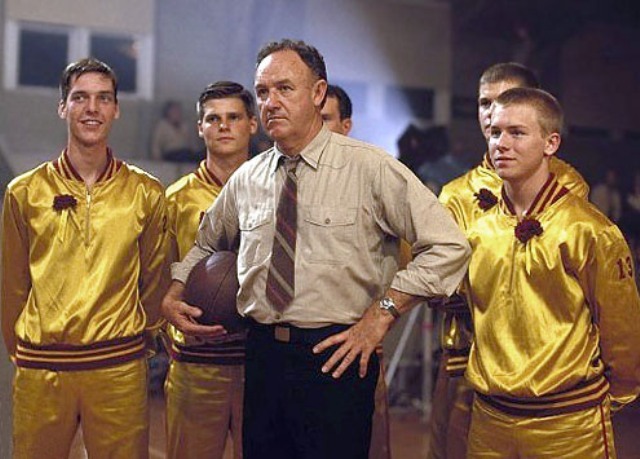 Other underdog Sports movies do a good job of playing up the underdog formula, like Rudy (1993) and Miracle (2004), but few have made something so small feel so grandiose as Hoosiers did. So, why do some sports movies have such a lasting resonance while others don’t? I think it’s because of the fact that you’re trying to work two forms of entertainment together and make them feel like they’re the same thing. We watch both to feel entertained, but experiencing the ups and downs of a movie is quite different than those of a live sporting event. Drama in sports comes from a lot of factors. It’s sometimes not what’s going on the field that matters to us, but rather the implications that the game means in the larger picture that we find so intriguing. The lives of the athletes outside the sport and the baggage they carry with them can often impact our outlook on the game. Sometimes it’s our hometown pride, or our wanting to see the smaller team undo the lofty expectations of the bigger team, in order to shake things up and make them more interesting that we enjoy. In any case, these are things that are hard to translate into film. Usually the success of a sports movie rests on the effectiveness of capturing that aura around the big games. That, or they effectively use sports as backdrop for the interesting character dramas. Overall, there are many films that fall short, but it only highlights the ones that are destined to become classics. Though not particularly bound to the Thanksgiving season, these movies nevertheless have a customary presence around this time of year, especially when they play such a memorable role in the way it makes you value the role of sports in the larger cultural narrative. They even serve as good counter-programming when the live games themselves become boring. The Sports movie genre may seem formulaic to many, and continues to follow stringent genre rules more than some, but it’s also one of the most varied, and engaging of all cinematic genres. And when done right, it can even make a happy ending feel all the more worth it. And that’s certainly worth cheering for. It’s inevitable that sometimes two or more movies are going to be so similar that they’ll raise suspicions from audience members of idea theft. The Young Adult novel adaptation craze has been the foundation of a current swath of similarly themed movies, and it’s one that currently is being dominated and dictated by the success of the Hunger Games franchise. Based on the book trilogy by author Suzanne Collins, Hunger Games is a post-apocalyptic tale focused on the destinies of a select group of young fighters that are forced into combat for the benefit and amusement of their oppressive political system. Both the novels and the films have become monumental successes and are continuing to inspire many like-minded franchises based around many of the same themes, like this year’s Divergent and The Maze Runner. But, even though The Hunger Games is a standout series, many people have questioned it’s own originality, and have even gone as far as to claim that it was a complete ripoff of another popular story. That story happens to be the Japanese made Battle Royale series. Originally created in Manga comic form in 1999, the book quickly inspired a film adaptation that was released in 2000, which also spawned a 2003 sequel. Battle Royale precedes Hunger Games by nearly a decade, and it’s very clear that there are some strikingly close similarities between the two. They both depict young people forced into combat by an oppressive government, they both have a central love story between it’s main heroes, and they both show the characters working the system in their favor in order to undermine it. But, even with all the similarities, did Hunger Games real steal the idea, or did it do enough to differentiate itself from Battle Royale. A simple argument in Hunger Games favor is that Battle Royale isn’t all that original either. In fact, the basis for these stories goes back a long way, as themes of oppressive governments and conformity gone horribly wrong has been present in literature and media for centuries. Just look at George Orwell’s 1984, and you can see the inspirations for much of the Hunger Games visual aesthetic. Likewise, Battle Royale’s setting on a deserted island far off the Japanese mainland recalls a similar backdrop from the Richard Connell 1924 short-story The Most Dangerous Game, which of course was all about the hunting of human beings. Other literary inspirations include the 1948 Shirley Jackson short story, The Lottery, which very directly served as an inspiration for both Hunger Games and Battle Royale. In The Lottery, a small American town selects one of their youngest citizens at random out of a basket of names to be ritually sacrificed in order for them to have a prosperous harvest season. Obviously, that random choosing from a lottery of names sounds familiar to any Hunger Games fan out there. Another influence on these movies could also be the 1982 Stephen King novel The Running Man, which later spawned the 1987 Schwarzenegger headlined film adaptation. That film not only influenced the human vs. human combat seen in Battle and Games, but it also inspired some of the sharp satire of the media seen in each, to varying degrees. Suffice to say, both Battle Royale and Hunger Games are following a long line of similarly themed stories, so to say that one is stealing from the other is ignoring the fact that they’re all part of the same trend. In the end, it’s not about the same ideas but how well they execute them in their individual stories that makes these movies distinct from one another, and as a result, they are much more different than you might think. One way in which the two are very different is in terms of scale. Battle Royale is ambitious, but is also crafted on a modest budget. Everything takes place in the same location and the visual effects are kept to a minimum. In some cases, the only effects that Royale actually employs are pyrotechnics and specialty make-up on the actors. Hunger Games on the other hand has all the visual splendor of a grand scale Hollywood epic. It’s clear that Hunger Games benefited from a full studio treatment when you see all the work put into the set design, the visual effects, and even the costumes. The dresses worn by actress Elizabeth Banks as the flamboyant character Effie Trinket probably boasted of a seven figure budget alone. But, all this works to the different movies’ strengths. Battle Royale feels very immediate and closer to reality, so a smaller scale helps to make that feel more authentic. Hunger Games is otherworldly, so it’s got to reflect that by immersing us into sights unseen, and that obviously costs a lot of money in the end. 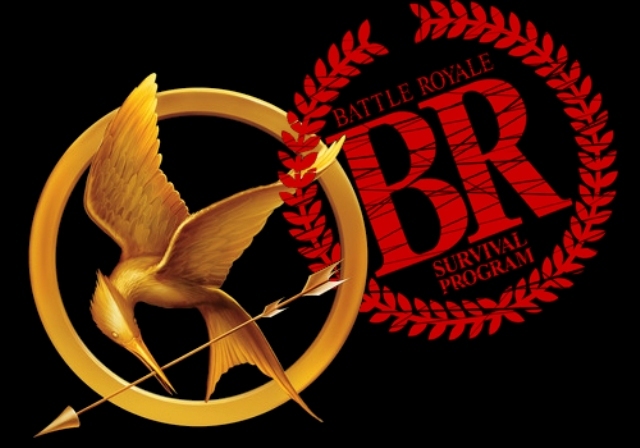 Overall, it’s the big advantage that Hunger Games has over Battle Royale. It does a much more effective job at world-building, or to put it more directly, presenting us with the why, where and when of the film’s setting. With the help of Suzanne Collins novels as the groundwork, we get a better sense of how the titular Games fits within the society, and how the characters’ struggles fit within the larger picture. Couple this with the fact that Hunger Games also retains it’s own identity because of it’s unique setting and by how well the filmmakers have brought that to life. Less capable hands may have not brought out the subtlety in the material and would have let the movie’s visuals run amok, but Hunger Games has thankfully transported us while still feeling firmly grounded. Battle Royale doesn’t have the same amount of time, however, to explain the details of why these events are taking place. The movie quickly takes us right to beginning of the battle without presenting too much in the way of context. All we see are a group of 40 teenage students all gathered together in a rundown school on a deserted island where they’re all told that they will be thrown into forced combat with one another. Any attempt to disobey and try to escape will result in their death and the last survivor will be granted their freedom. We get just the basic outline of the rules, laid out by the overseer of the Battle, Kitano-sensai (Takeshi Kitano), who represents in a subtle way the embodiment of government oppression that’s forcing this cruel act on these kids. And it’s this subtlety that works very much to Battle Royale‘s advantage. It doesn’t waste any time plunging us into this strange new world. Instead, it lets the audience piece together all the rules and has us discover the intricacies of the plot as they happen. I particularly like how character details that weren’t apparent before come out in interesting ways as the characters are pitted against one another. Hunger Games allows character moments to happen as well, but they feel a bit more telegraphed due to the fact that the they’ve been established long before the Games even begin. When characters are thrown through an ordeal like this, different emotions come out and the characters turn to more animalistic instincts in order to survive. Battle Royale shows this in a much more interesting way, and I think that’s partially due to the blank slate that we are given with these characters from the beginning. In this case, the more visceral, small scale approach gave this type of story the edge it needed. The same subtlety also works well with depicting the theme of government oppression. Both stories do a good job of presenting the competitions as a means of dehumanizing the less fortunate and offering them up as fodder for the upper classes’ amusement. What I believe Battle Royale achieves to a better degree than Hunger Games is showing the face of that oppressive body on screen. In Royale, the government body is brilliantly humanized in the form of the character Kitano. Takeshi Kitano brilliantly portrays the inhuman coldness of an oppressive government through his portrayal of an unforgiving social servant. 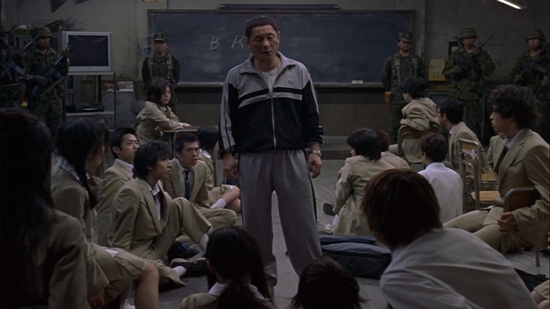 Once a school teacher to all the same students forced into competition, Kitano applies the same attitude to this inhuman practice that he would apply in the classroom. Throughout the film, he is constantly talking down to the kids, as if he was still delivering them a lecture, which is a great subtle way to reinforce the idea of how governments can devalue human life in order to get them to do what they want. Hunger Games is less subtle with it’s depiction of government oppression, showing the whole fictional land of Panem ruled over by President Snow (Donald Sutherland), a pampered aristocrat who rules with an iron fist from his lofty palaces in the Capitol. It’s made very apparent from the beginning who the bad guys are in the story, and there’s no sense of any other interesting layers with the antagonists in the Hunger Games; although Sutherland still performs the hell out of the role, and is a joy to watch. I think the reason the theme of oppression works better in Battle Royale is because of how unexpectedly it comes out of the story. It’s an added layer to a violent story-line that is very well appreciated. But, what Hunger Games lacks in one theme it makes up for in another. One thing that I did appreciate a lot from the story was it’s very shrewd observations on the role of media. The influence of propaganda is particularly focused on in the story, as is how different parties can manipulate the media to their own advantage. What I particularly like about this aspect of Hunger Games is that it works both as a subtext to the story and as a functioning element in the growth of the characters. Katniss Everdeen (Jennifer Lawrence) is depicted throughout the story as a the most skilled and resourceful fighter in the entire games, but throughout the story, we also learn her one weakness, and that’s the ability to fit within society’s expectations. Once she becomes a part of the games, Katniss must not only be a good fighter, but also be beloved by the public as well. Considering her rebellious attitude, as well as her awkwardness in front of a camera, this becomes a challenge for her. And considering that her livelihood inside the games is dependent on her ability to find sponsorship, it becomes a life and death situation as well. This is a great way to make the theme of propaganda and media manipulation work both as satire and as a plot thread in the story-line. The film does a great job of skewering the way media works, especially with the absurdity that we find so abundant in reality television. But, it also helps to define the characters as well. With it, we see that even Katniss has flaws, and by overcoming them, she’s better able to be a true hero. This is something that is only hinted at in Battle Royale, and never truly explored or explained. I’m not even sure the whole event is even televised. Only a subplot with computer hackers gives us any hints into this kind of theme in the film. So, it’s definitely a case where Hunger Games presented something very different and interesting. There is one plot thread that did manage to become a part of both story-lines, and that’s the romantic subplot. The romantic plots are so similar in fact, that it probably is what has sparked so many claims of plagiarism among many Battle Royale fans. Both stories find two of the combatants from the same background and social class linked together from early on and bound together to the very end, relying on each other for survival. And in each story, they are also the last two to survive, subverting the rules of the competition as a result. In Battle Royale, it is love that bounds the two survivors Nanahara (Tatsuya Fujiwara) and Nakagawa (Aki Maeda) together, though their relationship is played up in an innocent way. In The Hunger Games, the love story is more complicated. Katniss has had one love back home (played by Liam Hemsworth), but during the competition, she finds herself more drawn to her friend and fellow competitor Peeta Mellark (Josh Hutcherson), whom she relies heavily on for comfort and assistance as the Games grows more deadly. Though Hunger Games has a love triangle in it’s story-line, it’s the relationship between Katniss and Peeta that drives the heart of the story more, and in that sense, it feels as much the same as Battle Royale. Both work to varying degrees, but are never the main focus. I don’t believe that it represents Hunger Games being a copycat in terms of story, however. Suzanne Collins drew inspiration from a lot of other love stories built around adversity, so the fact that it feels so similar to Battle Royale is just a byproduct of the fact that some themes have universal meaning and usually wind up going towards the same places. So, with two similarly plotted movies, is it true that one stole from the other. I think that history has shown that this kind of story has been done many times before, and neither is really as original as either of their fan-bases would claim. Still, they are close enough to draw comparisons and some of their similarities work better in one over the other. I do admire the subtext underneath both, showing that they are more than just a collection of brutal action scenes. But, based on my own personal tastes, I would actually give the edge to Battle Royale over Hunger Games. Games is a beautifully constructed series of films that does translate the material in a smart and engaging way. Battle Royale does, however, feel more visceral and it gets away with a lot more. 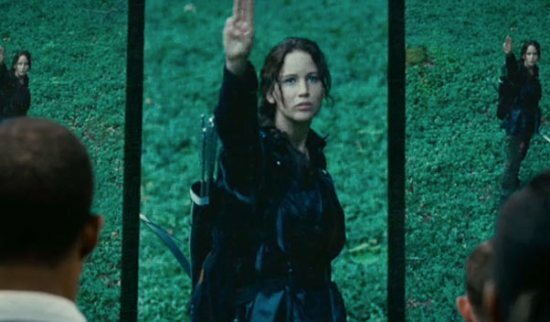 Hunger Games feels like it’s shackled by the PG-13 rating that is standard for all blockbuster franchises from Hollywood. Battle Royale, on the other hand, displays everything in full graphic detail. Whenever a character dies in the movie, you feel the full impact of the horror of the moment, no matter how minor the character is. 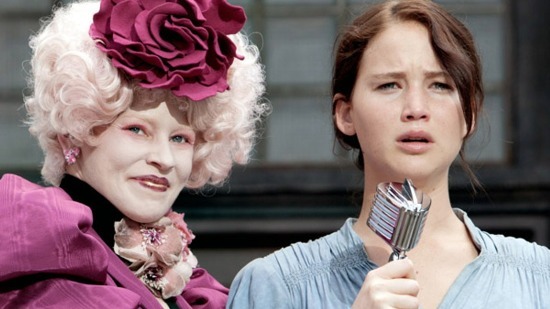 Hunger Games feels tamer because so much happens off-screen. In fact, most of the other combatants in Games remain nameless to us, and are therefore more expendable, as the movie only focuses on the main characters. That works to The Hunger Games advantage, but for me it didn’t have the same impact. Battle Royale is a very interesting import from Japanese cinema and presents a very interesting look into their culture. After all, Government oppression is something that is all too familiar in Japanese history, so it’s not surprising that they would have such a grounded view on the theme. Hunger Games by contrast plays it safe, and that’s it’s disadvantage. So in a direct competition between the two like-minded films, it turns out that the odds fall into Battle Royale‘s favor. Recently I went to see a new film called Birdman: or (The Unexpected Virtue of Ignorance), directed by Mexican auteur Alejandro Gonzalez Inarritu (21 Grams, Babel) and starring Michael Keaton, who of course is best known for playing the role of Batman back in the 80’s. The film was absolutely outstanding and will probably be near or at the top of my best of the year list. But, as I was watching the film, I was struck by not just the story, which cleverly derives from Keaton’s own career as an actor trying to move on after playing a famous superhero on film, but also by the technical wizardry involved in it’s making. The film is low key and features very little in the way of visual effects, but what it does feature is some truly awe-inspiring camera work. While not apparent in the trailer, what you’ll soon discover watching the movie Birdman is that it makes extensive use of the technique of long, unbroken takes. In fact, the entire film is made up of long takes, stitched together so brilliantly that you’ll almost think that the whole thing was made in one two hour long continuous shot. It’s a remarkable visual experience and it perfectly compliments the story being told, which centers around a group of actors led by Keaton’s Riggan Thompson as they put together a new play on Broadway. Stage actors of course must put on a performance live without cuts or retakes, so a movie that let’s the cameras keep rolling reflects that same style in the best possible way. It may not seem like a difficult thing, especially when applied to a modest budgeted movie like Birdman, but anyone who works in film will tell you just how extremely difficult this kind of technique is, because it’s time consuming and it requires a lot of things to go right all at once. Still, it is a favorite technique for many filmmakers to undertake and an even better experience for audiences to enjoy. The reason why the technique is such a difficult one to pull off is because of the amount of choreography that needs to happen. It may look effortless on the screen, but what the audience doesn’t see is the stress that a long take puts on the crew and the cast. Actors must hold their composure and hit their marks exactly so as to keep up with the pace of the camera movements. If they are thrown off by anything, like an extra getting in their way, or suddenly forgetting their line or start to laugh uncontrollably, then the set-up must go back to square one to reset. And every time the shot resets, it puts more strain on the crew who are trying their hardest to keep the shot running smoothly. Imagine being the cameraman through all of this, as you have to carry heavy gear on your back and you’re also under the pressure of keeping everything in frame for an extended amount of time. Because of the extensive amount of movement involved, most long takes are usually handheld. And when the camera is being carried around the set, it puts more stress on the crew to stay hidden as the scene plays out. Needless to say, there’s a lot that could go wrong while composing the scene. Usually a lot of rehearsal is needed to pull these shots off, and when it works, it looks spectacular. There are risks involved, however, such as the technique appearing pretentious if the material it is trying to present is not all that interesting. That and a poorly choreographed and composed shot may just end up boring the audience rather than exhilarating them. Thankfully Innaritu is a capable and experienced enough filmmaker to pull off the technique of long takes, and his work in Birdman represents a great addition to a long tradition. The technique of long takes extends back to the early days of cinema. Buster Keaton would let his cameras roll for protracted amounts of time in order to get those amazing stunts of his fully covered. Similar to what Innaritu does with his shots in Birdman, Buster Keaton would stitch together different shots in a way to give the illusion that everything was done in one take, which was used spectacularly in the dream sequence of Sherlock Jr. (1924). Beyond the silent era, long takes became less commonplace, although film editing in that same period was more relaxed than it is today. Today’s quick paced, music video style editing is markedly different than the style of Hollywood’s Golden Age, which is probably why long takes stand out so much today. Back then, movies would play out a scene with stage-like steadiness, relying less on close-ups and fast-paced editing and letting the actors and dialogue guide the action instead. But even with the more relaxed editing style of the period, there were some filmmakers who enjoyed making elaborate long take shots for their movies. Probably the most famous example would be the opening shot of Orson Welles’ 1958 masterpiece Touch of Evil. The movie opens on the image of a criminal carrying a makeshift bomb, and then pulls out to reveal the criminal running through a parking lot. The camera then swoops across the rooftops and drops down onto a street full of pedestrians. Once there, the camera then zooms in on our main characters (played by Charlton Heston and Janet Leigh) as they are walking down the street. A moment later, the car carrying the bomb passes by them. The two characters stop for a moment to kiss, but are interrupted by the blast of an explosion. It’s at that point that the movie sees it’s first cut to another shot, which is remarkable considering all the activity that we saw in the previous shot. It’s an amazing, groundbreaking shot that has continued to influence filmmakers to this day. Long take shots matured in the decades since Welles, and were particularly popular with filmmakers from overseas. The long take became a popular technique for the Kung Fu genre in Asian cinema. Naturally, Kung Fu films wanted to showcase the amazing stunt work of their actors, so letting the cameras roll without cutting the action was the best way to present that. This is true with a lot of Jackie Chan movies from the 80’s and 90’s. By letting the action play out, Jackie Chan was better able to convince audiences that he was the real deal as the scenes progressively became more and more elaborate as they went along. This tradition of long, unbroken takes in Kung Fu and martial arts movies continues to this day, with recent classics like Oldboy (2003) and The Raid: Redemption (2011). One particular director who put his own noteworthy stamp on the technique at this time was Chinese director John Woo. While more of an action film director than a martial arts director, Woo managed to be influenced by the films of this genre as he prepared some of the more elaborate scenes in his movies. Probably his most famous long take is the amazing Hospital scene from the movie Hard Boiled (1992). Although only 3 minutes in total length, this spectacular scene involves so many technical effects and precisely timed stunts that it is a wonder to behold as it plays out. There’s even a moment where the film’s star Chow Yun-Fat enters an elevator and proceeds to continue his shootout on the next floor without interruption. This was accomplished through a rapid fire redress of the same set that you don’t see on screen. It just shows how some filmmakers have managed to push the technique farther than ever before and continue to raise the bar. Today, that bar has been raised to the point where long shot takes no longer have to be complex, they have to be spectacular. In many ways, it has turned into the ultimate challenge for directors, and only the boldest ones out there are willing to take the plunge. Thankfully, today the tools needed to pull off the process have become less cumbersome. Digital cameras are much lighter than their film based fore-bearers, and are less distracting to the actors as well. Stanley Kubrick brought the Steadicam into the film-making process, when he employed it on The Shining (1980), which made it easier to follow the action on foot without having to hide any of the wiring and heavy equipment attached to the camera. This was used to great effect with the scenes showing young Danny Torrance riding his tricycle through the Overlook Hotel’s long hallways. Also, digital manipulation has helped to mask some of the imperfections of lengthy one-shot takes, and even gives the audience the illusion of a long take when it really isn’t one. Alejandro Innarritu’s friend and colleague Alfonso Cuaron has included many such long takes in his movies, and often they are so complex that there’s no way to make them workable without digital reinforcement. This is true with scenes from some of Alfonso’s most spectacular films like the Time Turner sequence in Harry Potter and the Prisoner of Azkaban (2004) or the amazing 12-minute opening shot of Gravity (2013). Both of those moments called for digital enhancement, because there was no way they could be done in reality, and yet they still look like a seamless one-shot take. It’s a brilliant example of how to make the technique work today with new technologies and still feel like they’re worthy of the legacy. That’s not to say that every long take shot needs to be full of energy and movement. Sometimes the most captivating long takes are ones that just lets the action play out in real time, helping to absorb the audience into the scene and forget that they are watching a movie. Many indie filmmakers are particularly fond of this kind of technique. Paul Thomas Anderson in particular has made great use of the long take in his films, which he frequently uses as a way to establish a setting or a character in the most elaborate way possible. And for Anderson, the artistry is not in the way that the camera is moving, but what is captured in the frame that matters. You look at the long shots from movies like Boogie Nights (1997) or Punch Drunk Love (2002) and you can see all the intricate detail that’s put into the characters actions on the screen, even sometimes when it’s something they are doing in the background. Quentin Tarantino also lets his scenes play out as a way to build character and mood, like the spectacular long take of Leonardo DiCaprio’s dinner scene monologue in Django Unchained (2012). But one of the most amazingly restrained examples of a long take shot that I’ve ever seen in a movie was in the film Hunger (2008), directed by Steve McQueen of 12 Years a Slave fame. In it, there is a scene where Irish activist Bobby Sands (Michael Fassbender) is visited in prison by his priest (Liam Cunningham) during a hunger strike. The two men sit down for a conversation that lasts over 10 minutes and the shot is from a wide angle, with both actors occupying either side of the frame. Amazingly, the camera holds on this wide shot for the entire scene (all 10 minutes of it) and never cuts to a close-up. This could have failed if the dialogue wasn’t interesting, but both actors feel so natural and the lines they deliver are so well written that the moment ends up being captivating. It’s remarkable that an un-moving camera can have such a captivating effect, but director McQueen pulled it off. There are many ways to make the technique of unbroken long takes work in a film, and the amazing thing is how many different ways it can work. Pretty much, you can put the technique into any film and any scene and it would still work; it’s not about where you place it, it’s just how well you execute it. Sometimes, when a long take becomes your signature style, it’ll end up finding it’s way into any story you wish to tell. That has been true with British director Joe Wright, who has managed to put at least one long take into each of his movies, which range from adaptations of classic romance like Pride and Prejudice (2005) and Anna Karenina (2012) to action flicks like Hanna (2011). Probably his most famous long take shot was in the movie Atonement (2007), which was a 6 1/2 minute trek along a war torn beach, featuring several vignettes of action played out in front of the camera as it passes by. That spectacular shot had to involve months of planning to pull off as the action pieces needed to happen at precisely the right moment in order to make it into the shot. Alfonso Cuaron also has made the technique part of his signature style. His most famous example of the technique is probably the 4 minute shot inside of a moving car in the movie Children of Men (2006), which was accomplished with a specialty rig built on the roof of the vehicle and was done with almost no digital manipulation. Cuaron continued to build upon his already amazing camerawork in that film when he made the spectacular Gravity last year, which features some amazing shots that continue on for nearly 10 minutes in length apiece. That spectacular camerawork earned both him and cinematographer Emmanuel Lubezki well deserved Oscars, showing that techniques like the long, unbroken take can help to gain a skilled filmmaker the notoriety that they deserve. Indeed, if I were to point to a film technique that I enjoy the best, it would be the long, unbroken take. There is just something purely cinematic about it. It displays what I think is the pinnacle of cinematic artistry, because it requires so much work, patience, and skill to pull it off. And thankfully, with film-making tools becoming much more reliable and less cumbersome than in years past, more filmmakers are gaining the confidence towards wanting to try their own take on these shots. This technique is even making it’s way to television, as was witnessed with an amazingly well choreographed long take shot seen in an episode of HBO’s True Detective. Hopefully, more filmmakers look at these amazing scenes in movies and become inspired to include them more often in the years ahead. It certainly works more effectively than the fast paced editing that you see in movies nowadays. For one thing, I was certainly glad to have witnessed a movie like Birdman which not only made use of the long take technique, but crafted the entire film around it. Some of it was done through clever editing or unobtrusive visual manipulation, but you can tell that there were many parts of the movie that had to have been done purely without cutting the shot. Probably the most spectacular one would be a scene where Michael Keaton’s character is accidentally locked out of the theater while still in his underwear. In order to get back in to perform his scene on time, Keaton runs around the building, crossing through traffic in a busy Times Square atmosphere, and reenters through the front lobby. In all, the shot I would estimate is ten minutes long, and considering all the mayhem he and the crew would’ve had to cross in order to get that shot done right, the end result is incredibly impressive. The whole movie is a brilliant showcase for the long take technique and I’m sure everyone who sees it will be just as engrossed as I was. It’s amazing to think that fewer edits in a movie can make it more harrowing, but this is proof that it’s possible. The vast openness of Space has inspired some of the greatest works of art known to mankind. Whether it is in paintings, or literature, or film, contemplating the cosmos has driven people to dream big and that ability to dream in turn inspires others to go further. Jules Verne’s classic novel From the Earth to the Moon conceived of a journey to the moon out of a capsule fired from a giant cannon. This imaginative story of exploration then inspired French artist and filmmaker Georges Melies to craft his own take on the story with 1902’s A Trip to the Moon, which was one of the early benchmarks of silent cinema. Melies imaginative film has since become one of the first of a whole new genre that we now know as Science Fiction, and it’s a genre that continues to inspire not just the minds of other like-minded storytellers, but also those in the scientific field who work hard to create fiction into fact. Jules Verne probably never would’ve believed that only 100 years after his novel was first published that it would become a reality, but that’s exactly what happened when Neil Armstrong took his first step on the lunar surface. But, even after conquering the achievement of landing on the moon, mankind still has a thirst for further exploration of space that is very much reflected in the art of the 20th century and beyond. Stanley Kubrick’s 2001: A Space Odyssey (1968) took the boldest step forward in theorizing where mankind would head next in our quest to learn about the fabric of Outer Space, and his movie continues to remain influential to this day. And just like how Verne inspired Melies to carry the dream of Space travel further, Kubrick’s masterpiece has inspired other filmmakers to look to the skies and imagine even greater tales to tell. And one such filmmaker who has taken up that challenge is Christopher Nolan with his new grand scale picture, Interstellar. Interstellar is unmistakably inspired by Kubrick’s 2001, with many references throughout the movie; some blatant, some subtle. It’s clear that Nolan is particularly fond of Kubrick’s movie, and Interstellar may in fact be the biggest and most expensive fan film ever made. But, although Nolan’s directorial mark is all over this movie, it actually didn’t start out as one of his projects. The script was initially written by Christopher’s brother Jonathan Nolan (whom he has shared writing credit with on 2001’s Memento and the films in the Dark Knight trilogy) with Steven Spielberg attached to direct. Spielberg remained involved in the development of the project for many years, but ultimately he dropped out in order to pursue other projects. Jonathan hoped to have another prestigious director pick up his ambitious script quickly thereafter, and luckily his own brother became available soon after the completion of The Dark Knight Rises (2012). After a rewrite with both Nolans involved, the project moved ahead towards completion. What’s interesting about this collaboration is that it marks a significant departure for both Christopher and Jonathan. Most of their work up to now has been grounded in reality, with maybe The Prestige (2006) being their only previous work of Science Fiction, and that one still had a very earthbound footing. Inception (2010) had it’s flights of imagination, but it existed in the realm of dreams, which helped to place the film in a still realistic place and time. Interstellar departs significantly from previous Nolan films in that it takes us beyond the natural world that we know and understand and explores the unknown, albeit in a very scientifically minded way. Did this departure create something bold and new for the Nolan brothers or was Interstellar a gamble that didn’t pay off? Like the movie itself, the answers are not all that simple. Though the movie has an original story-line, it’s concept is actually based on the writings of theoretical physicist Dr. Kip Thorne, who has become a leading voice in the study of Wormhole and Black Hole physics, and the developer of the “warped space-time” theory. Thorne has theorized that Wormhole anomalies in Outer Space are capable of transporting matter across great distances, essentially by folding time on itself. If mankind were to cross through the threshold of a black hole, they would come out on the other side in a part of space that would be far out of reach in the short life-span that human beings exist within. It’s a theory that opens up many possibilities about what and where human beings in the future may explore and that is the central basis that Interstellar follows through most of it’s plot. In the near future, the Earth is slowly becoming inhabitable because of climate change, and the remaining humans on Earth are running short on time. What remains of NASA hopes to explore possible livable worlds that exist in another galaxy that has become accessible to them through a wormhole sitting next to the planet Saturn. Expert pilot Cooper (Matthew McConaughey) is selected through an extraordinary set of circumstances to lead the expedition. Accompanying him is physicist Amelia Brand (Anne Hathaway), the daughter of the head scientist (Michael Caine) who conceived the overall mission in the first place. Cooper leaves behind his life and family in the hopes of finding a way to save the future for all mankind. The mission takes them to the limits of Space, testing both their resolve and their grips on reality, especially when one visit to a planet cause time to accelerate to the point where one hour to them equals ten earth years. At one point, Cooper watches the life of his family forward in an instant, and the daughter he left behind has now become the same age as him; played as an adult by Jessica Chastain. The movie definitely creates the scenario laid out by Dr. Thorne perfectly, making the exploration scenes the real standouts in the film. Unfortunately, the movie also suffers from an unfocused main plot, as it tries to be to many things all at once. I think that this is mainly due to the transition between this starting out as a Spielberg project and then turning into a Nolan project. There’s no doubt that some of the grittier, more information driven moments are perfectly handled by Nolan as a director, but they are interspersed with sentimental moments dealing with Cooper’s relationship with his daughter. The sentimental moments in the film would’ve been absolutely nailed by someone like Spielberg, who has become a master at sentimentality in movies. In Nolan’s hands, they seem a little less effective. Not that he does a bad job with them, but in Interstellar, they feel a little disjointed from the rest of the movie. I believe that when the movie went from one director to another, there was an attempt to try to preserve what was there before, and unfortunately Christopher Nolan just can’t do sentimental the same way that Spielberg does. The moment when Cooper says goodbye to his family, in particular, feels rushed and less realistic than it should be, especially given all of Nolan’s attempts to make this movie feel as authentic as possible. Though none of these moments completely derail the experience, they nevertheless make what could have been a great story feel more like an okay story-line, and that’s somewhat of a letdown for a director like Nolan who has become such a groundbreaking storyteller over the years with unconventional plots found in movies like Inception and Memento. But, what the movie lacks in story, it more than makes up with it’s visual experience. Nobody out there right now does epic scale better than Christopher Nolan, and Interstellar is a visual experience that is unlike no other. Believe me when I say that you will be taken on a ride with this movie, especially if you watch it in IMAX. Christopher Nolan has been a long time champion for large film formats, and Interstellar is no exception. Filmed in true 70MM IMAX, Interstellar must be seen on the biggest screen possible in order to get the full experience. When you see the vastness of the outer reaches of space depicted in this movie, it will take your breath away. And Christopher Nolan deftly handles the huge scale of this production with incredible precision, whether it is the quiet cruising past the orbit of Saturn (which feels very Kubrickian) or the harrowing perils that the explorers face as they investigate each new world. The scale of the movie is as massive as you would expect it to be, and really only the IMAX format can capture the true experience that Nolan was trying to convey with this picture. If you thought the city-scape folding in on itself in Inception was breathtaking, than wait until you see tidal waves the size of mountains or clouds frozen in midair, which Nolan vividly brings to life here. Even if the plot is lacking in some areas, there are going to be very few complaints about the visuals in this movie, and it will deservedly be up for many technical awards at the end of the year. What’s more amazing is that Nolan tried to use as little digital effects as possible, instead shooting as much as he could with physical elements. This is very impressive work, especially in the scenes within the cockpit of the space ship. The aural experience of the movie also helps to heighten the overall film. Believe me, many theaters across the world better have a good subwoofer in their auditoriums, because it will get a workout with this movie. Pretty much everything you can say about the look and feel of this movie can be summed up as massive. But at the same time, the movie does manage to give us characters that we can care about. Apart from Nolan’s Dark Knight trilogy, his movies haven’t been really driven by the characters that exist within them, but were instead defined by the actors that portrayed them. Interstellar is no differently, featuring a well-rounded cast of A-List stars all holding their own against the vast scale of the production. Coming out of his recent Oscar-winning past year, McConaughey continues his recent resurgence with a very restrained performance as the main protagonist Cooper. Within this role, McConaughey makes Cooper more than just a good pilot, but also a very thoughtful and intelligent human being who is more than capable at getting the impossible done. It may not be Christopher Nolan’s most standout character, but he doesn’t need to be. He doesn’t have many demons to overcome and his strength is more in his unwillingness to give up, which McConaughey delivers perfectly. One particularly powerful moment that the actor nails is when he watches videos of his family captured over the last 20 years that he had missed during the exploration. There were very few dry eyes in the theater that I was at when this scene played. Even better though is Jessica Chastain’s wonderful performance as Cooper’s daughter Murph in adulthood. The character is a tiny bit underwritten, but Chastain makes the most of her time, delivering a performance that really in fact balances the whole movie. Showing us what’s going on back on Earth, her story works perfectly in conjunction with what’s going on in space. There are also a pair of robots that help Cooper’s team on their mission, both of which were clearly inspired by Kubrick. Sort of combining the artificial intelligence of HAL 9000 with the stark rectangular shape of 2001‘s enigmatic monolith, the robots are interesting characters of in of themselves. The most notable one is named TARS, and he is programmed with a sense of humor setting, which makes him a much needed comic relief in the movie. Voiced by actor Bill Irwin, TARS is the exact opposite of HAL 9000, being resourceful and good-natured as opposed to homicidal. The other robot CASE (voiced by Josh Stewart) is less defined, but works off of the wise-cracking TARS perfectly. Nolan regular Michael Caine is perfectly fine in his limited role, and actress Ellen Burstyn delivers a memorable moment in the film as an elderly Murph near film’s end. There’s also an appearance from a big A-List actor half-way through the movie that took me by surprise, as this person remained un-credited through most of the production. Unfortunately, the actors who seem to get the short-end of the stick are Cooper’s fellow crewmen. Anne Hathaway does her best, but her character is the most thinly drawn of the whole film. The same goes for the other members of the team, who are obviously being set up as the casualties. But I think the fault is more in the writing and less in the actual performances, as every does the best they can. Overall, the performances are excellent and help keep the movie grounded, which is impressive given the scale of everything. So, the movie overall is a solid effort, if not an absolutely perfect one. I still had a extraordinary experience watching this movie, and I strongly recommend it for that alone. But the movie is already starting to have it’s detractors out there, and I would be lying if I said that they weren’t making some valid points. The story-line is a little shaky and it is less assured than some of Christopher Nolan’s other movies. I still view Inception as his masterpiece, and his Dark Knight trilogy is still a monumental achievement. But even if it is B-grade Nolan, that still means that it is far better than most other movies out there. I think that Nolan has just become a victim of his own high standards and for some good enough is not nearly good enough anymore. But even still, the movie is a visual wonder and is still an expertly crafted piece of cinema. Like Alfonso Cuaron’s Gravity, it portrays the emptiness of space better anyone had before, and perfectly portrays mankind’s tinniest controls over it. Whats more, it also inspires that same sense of wanting to explore further that has also inspired the likes of Verne, and Melies, and Kubrick. Space is definitely the final frontier for mankind, and hopefully a film like Interstellar inspires other to take that next step forward as well. It’s amazing to think that a dream imagined on cinema could become a reality in the span of less than a century, but we saw men walk on the moon, so hopefully Christopher Nolan’s Interstellar will inspire the explorers of tomorrow as well. 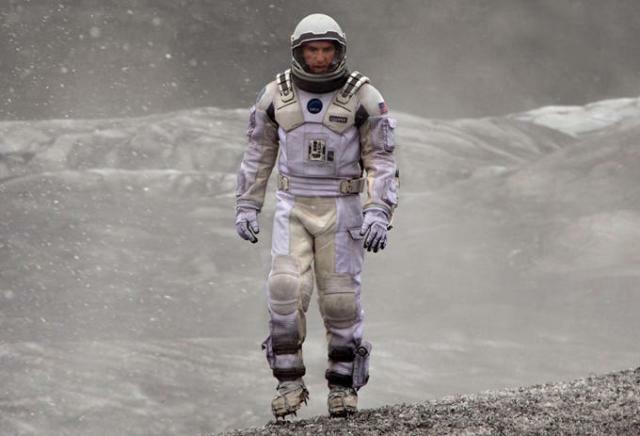 If that can be possible, Interstellar could end up being Nolan’s most important film in the long run. Regardless, it still stands as an impressive, albeit imperfect, cinematic experience that has to be seen to be believed. Whenever we round out our favorite comedies of all time, the film Ghostbusters (1984) is almost certainly at or near the top of that list for anyone in my generation. Crafted from the minds of writers and co-stars Dan Aykroyd and Harold Ramis, and directed by Ivan Reitman, Ghostbusters is a classic in every way, and even 30 years after it’s initial release, it is still a strongly influential comedy. That’s because of the fact that it takes a strong concept, that being a ragtag band of paranormal scientists forming a ghost extermination agency, and exploits that premise to it’s full potential. That and it’s just incredibly funny. The perfect casting is also what has made this movie so beloved. Initially conceived as a follow-up to the popular Blues Brothers film, the movie was written to star Aykroyd and John Belushi as a pair of titular Ghost Busters. Unfortunately, Belushi’s untimely death forced a re-imagining of the script, which proved to be a blessing. 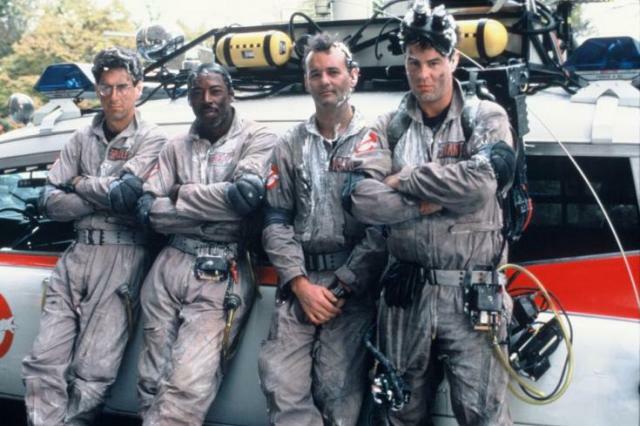 The team was expanded to include co-writer Ramis as the exceptionally nerdy Dr. Egon Spengler, as well as Ernie Hudson as the bewildered temp assistant Winston Zeddmore. But, the true keystone to the whole cast proved to be the addition of Bill Murray in the role of Peter Venkman, the cocky one-liner spewing hot shot that Murray was tailor-made for. Indeed, what most people love about this movie is just how well this cast works off each other, and just how funny they all are throughout. Murray almost steals the movie away on his own. But, what is interesting about the movie’s legacy after 30 years is how it modernized and redefined the way dark and scary themes can work as the basis for some hilarious comedy. Though no one would ever define Ghostbusters as anything other than a comedy, it is interesting to note that there are moments in the movie that are downright creepy, and would feel at home in any authentic horror movie. What’s more, nothing in the movie feels out of place. Every scary moment works, and the hilarious comedic bits fit right alongside it, sometimes even helping to punctuate the moment. None of the transitions in tone are jarring, and it all makes the film that more of a unique experience. That fine line between horror and comedy can easily be mishandled if the filmmaker goes too far in either direction. Ghostbusters is expertly crafted to the point where the movie crosses that divide effortlessly multiple times. Case in point, the depictions of the ghosts differ primarily between the frightening and the goofy, depending on what the film requires at the moment. The scene where the Ghost Busters encounter Slimer is more of a comical scene, so the look of Slimer the Ghost is obviously more cartoonish than scary. However, when the movie shows the heroine Dana (Sigourney Weaver) being abducted and possessed by the demon Zuul, the creature is rightfully depicted as a terrifying monster. Whatever the story calls for at the moment, the movie adjusts the tone and the scares accordingly, and Ghostbusters always seems to hit that tone perfectly. It even gets a funny one-liner in every now and then during a terrifying scene, like Venkman’s quip about Zuul’s “lovely singing voice.” But even though Ghostbusters modernized this kind of balance between the profane and the light-hearted, it was still one of many touchstones in the long history of Comedic Horror. Mixing the two genres together actually has been around since the early days of cinema. Even in some of the classic Monster movies of Hollywood’s Golden Age do you see some examples of adding levity to many dark films. Universal’s classic adaptation of Mary Shelly’s Gothic novel, Frankenstein, was a notably dark movie with very few moments played for laughs. However, when director James Whale was tasked with creating a sequel to his macabre classic, he chose to go in a very different tonal direction by injecting a lot of camp humor into the story. The result was The Bride of Frankenstein (1935), which has gone on to become a beloved classic in it’s own right. The movie is still frightening for the most part, with Boris Karloff still menacing as the Monster, but there are decidedly more comedic moments in this movie as well, primarily with the dimwitted townsfolk who hunt after Frankenstein. Mel Brooks would exploit that comical tone more when he made his own homage to the Horror classic, Young Frankenstein (1974), following James Whale’s own style, but removing all subtext and adding a whole lot more silliness. This kind of campy horror would become more prevalent during the 50’s and 60’s when the B-Movie phase began to dominate the cinemas. Just watch the works of Ed Wood and Roger Corman and tell me that their intentions weren’t to make their audiences laugh out loud between the screams of terror. But, despite the intentions of the filmmakers, there’s no doubt that a light sprinkling of comedy helps to make the horror feel more rewarding. That’s something that future Horror film master Sam Raimi definitely took to heart when he created his Evil Dead series of films, which skirt the line between scary and funny quite frequently. Even today you see many films try to make that balance work, although few have pulled it off as well. I think the reason why Hollywood has become accustomed to the idea of mixing Horror and Comedy together is because they have the same effect on the audience. For the most part, these are the kinds of movies that must be seen with a crowd, because the reactions you get out of the theater during a comedy or a horror film is also part of the entertainment. If a horror movie makes someone in the audience scream out loud, it will almost always get a laugh out of someone else and that usually is why most people love the communal experience of watching Horror movies. It’s the same kind of reaction we get out of a comedy movie too, and indeed sometimes the most laugh out loud moments we’ve seen could have come from a movie that was trying to be scary. Case in point, in Friday the 13th Part 8, there’s a scene where Jason faces a championship boxer whom he wears down by being un-phased by all the blows he delivering. When the boxer says he’s had enough, he asks Jason to “take his best shot,” which he does by knocking the boxer’s head off in one punch. It’s a hilarious moment in a place you didn’t expect it, and yet it doesn’t suddenly make the movie into a comedy. A recent film like Gone Girl also has a moment that goes from horrific to hilarious in the blink of an eye, showing just how much those two emotions work well together. It doesn’t work all the time, and indeed it more or less has to do with how well the tone is managed in a movie. For one thing, none of the films in the Scary Movie franchise are particularly scary; or for that matter funny. But it has been a formula that has proven itself countless times mainly because these are the kinds of movies that are perfectly geared to drive up box office numbers. The movies that we commonly associate with this formula are Dark Comedies. They are not primarily built around Horror tropes, but nevertheless they revolve around darker themes like death and suffering, while still playing moments and situations for a laugh. Again, Sam Raimi’s Evil Dead series is so outlandish, that you could argue that they were made to be comedies first and horror films second, especially with Army of Darkness (1992). But subtler dark comedies also manage to present that fine line in interesting ways. The Coen Brothers’ Fargo (1996) is a great example of comedy and horror working together to create a truly memorable experience. I mean, you had to have chuckled when you saw Steve Buscemi’s disembodied foot poking out of that wood chipper, just before you felt the dread of what that situation was actually meant. Human behavior gone horribly awry is what characterizes most dark comedies, with movies like Mary Harmon’s American Psycho (2000) and Peter Berg’s Very Bad Things (1998) also showing hilariously over the top moments of horror on screen. But, what makes these movies memorable is not by how outlandish they are, but by how effective they’re shocking moments elevate the rest of the film surrounding them. Sometimes the best way to do that is to subvert the audience’s reactions, and make them appreciate the unexpected. If you’re too predictable, and add humor or horror in places that didn’t need them, then you have confused and unpleasant messes like Jennifer’s Body (2009) or Death to Smoochy (2002), both of which didn’t know what the hell they wanted to be. But, not all comedies need to be dark in order to have scary moments. Ghostbusters never actually stops being funny throughout it’s entire run-time, and it underlines every genuine scary moment with something hilarious. It’s something that I think Ghostbusters defined better than any movie before and since, and most Horror comedies today follow along a similar tone that the movie established; giving us genuine frights while never missing the opportunity to crack a joke. If I could point out a movie of this current generation that has become the Ghostbusters of it’s time, it would probably be Edgar Wright’s Shaun of the Dead (2004), which itself is celebrating a 10th anniversary this year. Shaun managed to do for zombie flicks what Ghostbusters did with haunted house movies, and that’s by making a acceptable entry into the genre while at the same time lampooning it at every turn. Like Ghostbusters, Shaun is built more around the hilarious interactions of the characters, with the horror setting used mainly as the backdrop for all of their goofy antics. Stars Simon Pegg and Nick Frost clearly have an affection for zombie movies, and their inept buffoonish characters work very well in this setting, which is depicted in a very straight forward way. But, at the same time, the movie never falls into true horror, and is laugh out loud from beginning to end. Plus, it’s the only movie I know of with a zombie attack choreographed to the music of Queen. Most Dark Comedies can sometimes be mistaken as quirky Dark Dramas, but there’s no mistaking movies like Ghostbusters and Shaun of the Dead for anything other than a Horror Comedy.